Changing the tier of the patient’s drug or adding new restrictions on the medication placing it out of reach for patients. It’s important to understand that although patients can’t renegotiate their contracts mid-plan, insurers are free to change formulary coverage however they wish, whenever they wish. Since these formulary changes can happen at any time, they often occur mid-plan year, when patients have no choice but to stay with the plan. Essentially, patients are not being provided with the benefits that were marketed to them during the open enrollment period. Whatever form it takes and whenever it occurs, non-medical switching can be very harmful to patients. As a result of being switched from their original, clinician-prescribed medication, patients may experience additional side effects, symptoms, disease progression, and even relapse. Beyond the immeasurable impact of this unnecessary suffering, the negative effects of non-medical switching can result in additional medical appointments, emergency room visits and even hospitalization, thereby actually increasing overall healthcare utilization costs. The adverse physical, mental, emotional, and productivity impact of non-medical switching on Florida’s chronic disease patients. Based on the reported demographics, this survey sampled a diverse, representative cross-section of Florida’s chronic disease patients. A cohort of ninety-nine Florida patients accepted the invite to take the survey. Thirty-seven either reported that they did not have a chronic disease or failed to finish the survey, and as a result, were not considered in the final analysis. The eligible respondents were comprised of five major classes of chronic diseases: autoimmune (35.5%), neurological (30.6%), mental health (14.5%), oncological (4.8%), and other (14.5%). A majority were female (79%), white (89%), college educated (69%), and not currently employed (61%). The median income reported was $39,750 (+/- $42,011). All types of insurance coverage were represented in our surveyed population. Private insurance was held by the most number of respondents (53%), followed by public insurance (29%), followed by a combination of private and public insurance (6%). Eleven percent of respondents did not provide their insurance type. Results of this survey show that it is commonplace for chronic disease patients in Florida to experience sudden decreases in prescription-medication coverage. Over two-thirds (68%) reported that their insurance company has made changes to their health plan’s formulary that reduced coverage of their prescribed medication. These cover-age reductions were found to be so dramatic that nearly three-quarters (74%) reported that the primary therapy they were using to control the symptoms and progression of their disease became suddenly and significantly so expensive that they were forced to switch to an entirely different medication. Overall, effectively, one out of every two (50%) of our survey respondents reported being financially coerced by their insurance companies to change their clinician-prescribed medication for non-medical reasons. Additionally, a significant majority (60%) reported subsequently being delayed from accessing or obtaining their prescribed medication as a direct result. When investigating communications by third-party payers to inform patients about formulary changes, our survey found nearly half (48%) of all respondents reported never receiving any notifications, such as letters, emails, or phone calls, communicating details of their plan’s formulary or changes being made to it. When respondents experienced alterations to their plan’s formulary, less than a third (31%) reported their insurance company informed them of the altered coverage to their prescribed medication. 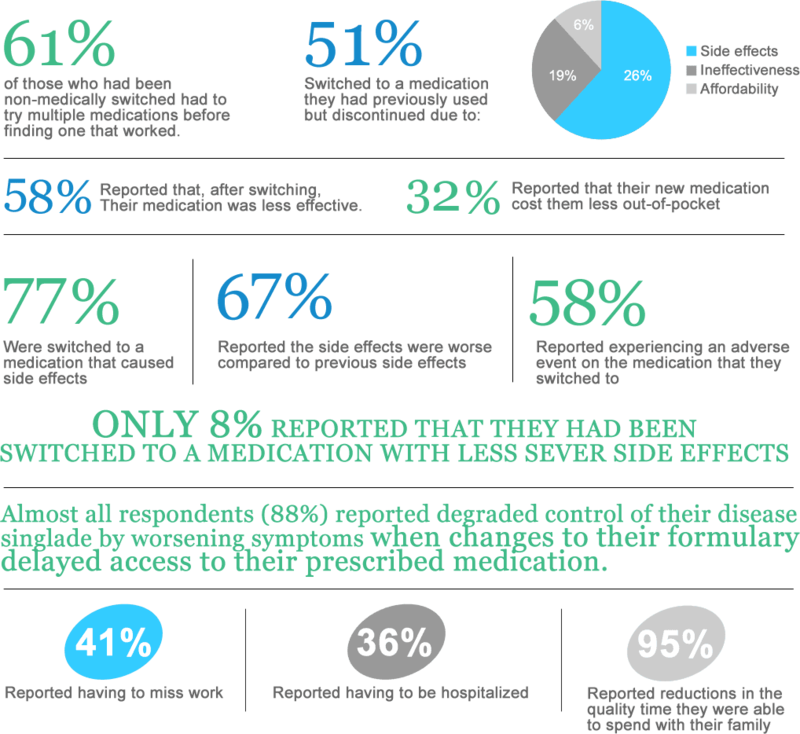 A majority of respondents (69%) were informed second-hand by their pharmacist (55%) or physician (14%). Furthermore, when respondents report-ed experiencing alterations that decreased coverage for their prescribed medication, only 21% reported that their insurer was transparent that the changes were being made primarily for cost concerns. Our survey has shown non-medical switching is a prevalent and growing practice in Florida. It can put patients who have complex, chronic, or rare diseases at severe risk. Multiple switches can either force patients onto less effective and more dangerous medications or eliminate treatment options for patients in a disease state that has a limited bank of therapies. Health insurance companies’ utilization management techniques, such as reductions in drug coverage, result in treatment gaps and cessation of effective therapy, therapy that often takes years to find. As a result of associated increases in side effects and adverse reactions that can lead to hospitalization, more doctors’ appointments, emergency room visits, and so on, non-medical switching can actually increase overall utilization costs. Currently, there are no state protections for patients in Florida from mid-year formulary coverage changes. Florida needs legislation to ensure that insurers honor their contracts with patients in order to ultimately protect the health of patients.